interact with lots of ferrets! For the shelter, your gift of time can be priceless! You can give the operator or staff a much-needed break or assistance doing things they aren’t able to fit into their regular schedule. Perhaps you have a special skill, like photography, that the shelter desperately needs. And you are helping the animals in the most hands-on manner possible. Here are some tips to fit in smoothly and maximize your experience. Larger animal facilities will have a set of guidelines, set schedules, and specific jobs for volunteers. There may also be an application and a Volunteer Coordinator to provide orientation. Most will also have an agreement you must sign before you are allowed to volunteer. Small, especially home-based shelters, are more flexible in some ways and less flexible in others. You must – especially at first – be available when the operator is there. But you may have a wider range of tasks and will have the opportunity to see shelter work from A to Z.
Shelters normally have age guidelines for volunteers. Some only accept teens over 16. If your child is younger and wants to help, expect you must accompany and supervise them. Realistically, children under 11 or 12 are rarely very helpful; it’s admirable to expose them to volunteering, but you will be responsible for the work. Every shelter has different needs. Helping to clean cages on a weekly or bi-weekly basis is wonderful, but if you can’t offer that much time, there are “one-time” or periodic jobs, too. If you live at a distance, you may be able to help with computer project work or animal transport. Maybe you can sew bedding, help at events, or obtain product donations. You may have professional contacts that can give the shelter reduced fee accounting or legal advice. Ask what the shelter can use and offer what skills or talents you can share. Make a commitment and follow through. Meet with the director or coordinator, let them explain the work you will be doing and times help is needed, then decide if it’s right for you. They are investing time in meeting and training. They expect that you will complete the task. For regular shelter jobs, a commitment of at least a few months is reasonable. Be reliable! Very small shelters, in particular, will depend on you to be there when you say you will. Don’t leave the staff wondering if and when you will show up. Its common courtesy if you can’t be there, that you give as much notice as possible (at least 24 hours unless an emergency arises). Ask in advance about inclement weather cancellations. You are there to help and free up regular staff time. While staff should be friendly and welcoming, expecting them to chat for hours is inappropriate. Consider teaming up! The shelter may appreciate you and a friend volunteering together. It gives you company and reduces the potential for leaving them without aid if you can’t make it. They may be able to match you with another volunteer. Every shelter has its own specific cleaning routines and procedures. Suggestions for improvements are welcome, but deciding on your own to change things up are not. Be considerate of the person who will be doing your job next time – if you run out of cleaning supplies, restock them. If food bins are low, alert the appropriate staff member. Follow and adhere to shelter policies. 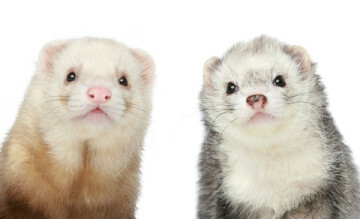 If you fall in love with a rescue ferret, expect to fulfill regular adoption requirements. Shelters may offer helpers certain considerations (like a discount on adoption fees), but expecting that your volunteer service equals free animals is unreasonable. You can be another pair of ears and eyes for the shelter. If an animal looks unwell, please bring it to someone’s attention. Check every animal in every cage and make sure, if allowed to take them out, you count heads when you put them back. A shelter should be willing to complete any volunteer certifications you may need. Schools, churches, or community service agreements will ask for a signed letter or form verifying you completed your volunteer requirement. We hope you will consider sharing your time and energy with a shelter by volunteering.